Did Adolf Hitler have a girlfriend? Google entries to the likes of “Did Adolf Hitler have a girlfriend,” “Young people are all mean” and “Modern torture devices” all appeared on the laptop of the perpetrator of last year’s Isla Vista massacre, according to the Santa Barbara County Sheriff’s Office. The sheriff’s office has released a report detailing its investigation into the Elliot Rodger rampage that left seven dead in Isla Vista on May 23. Rodger killed three people with a knife and shot another three victims to death prior to committing suicide amid a shootout with deputies. Investigators concluded that Rodger acted alone in the crime spree. The report describes Rodger as a shy, mentally ill, video game-loving community college student who had an affinity for luxury items and was desperate for a girlfriend. Rodger received several mental illness diagnoses in his childhood, including an autism diagnosis at age 15, according to the report. He took numerous prescription medications and was on Xanax to treat anxiety when he committed the murders. 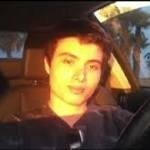 Rodger left behind a 137-page manifesto, which detailed a plot he tried to carry out on his “Day of Retribution.” The plot consisted of killing his roommates and anyone else at his apartment; murdering as many women as possible at the Alpha Phi sorority house; and finally driving around Isla Vista, attempting to kill as many people as possible by crashing his car into them or shooting them. He also kept two journals that contained entries about his plan to get a girlfriend and lose his virginity. The plan to attract women centered around Rodger becoming a multimillionaire by winning the lottery. After several failed attempts to win the lottery in California, Rodger drove to Arizona where he spent $100 on tickets. When he lost in Arizona, he wrote in his journal that all of his hopes and dreams were shattered. Just before his rampage, Rodger emailed his manifesto to relatives and acquaintances and released a YouTube video describing his intentions. He then committed six counts of murder; three counts of murder under the special circumstance of lying in wait; 20 counts of attempted murder; three counts of carrying a loaded firearm in public; and 16 counts of shooting a firearm from a motor vehicle, according to the sheriff’s report. The sheriff’s investigation is now closed. However, the Santa Barbara County District Attorney’s Office will still issue a ruling on whether or not deputies acted legally by returning fire on Rodger. I don’t think these murders so much made a case for increasing gun control, as they did make a case for legalizing prostitution. For the money this little creep spent on lottery tickets, he could have gotten himself laid at a legal brothel. Then maybe six more souls would still be alive today. Should have driven to The Chicken Ranch instead of buying those lotto tickets.